On Saturday, May 6, 2017, 4 of us hiked from Paine Mountain to Irish Hill. We left one car at the end of Darling Road, which runs off Route 2 near Ellie's Farmstand and parked the other car in the lot at the Shaw Outdoor Center at Norwich University. From the Shaw Outdoor Center, we hiked to the wooded summit of Paine Mountain. The trail has much better signage than the last time I was there. From the wooded summit of Paine Mountain, we bushwacked across three knobs to Irish Hill. 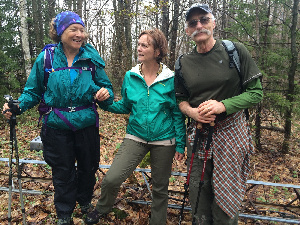 Soon after descending from Paine Mountain to the junction of the Turkey Hill woods road, we began the bushwhack, heading north into the woods, along the ridge line. We found a faint footpath and skirted along an old beaver pond. On one of the knobs, we found an old, large television antenna. Then we hit a woods road (which may ascend to the former Poor Farm), where we had a nice view of Berlin Pond and passed a network of sap lines. From there, it was easy hiking to Irish Hill and down to Darling Road. The hike took about five hours and two different phone apps recorded it as 8.7 miles. Along the trails, we saw beautiful spring wild flowers, including blood root, ramps (wild leeks), spring beauty, trout lily and violets. We started in a light drizzle, had a long dry spell and ended in a light rain. Not bad for a spring hike! The hike is described in William Osgood's Paine Mountain Trail Guide, which is available for sale at the Northfield Public Library.